Here we are going to see some example problems on composition of functions. Before going to see example problems, let us see what is composition function. 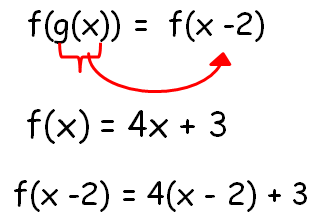 It is an operation being used to combine the given two functions. Let f(x) and g(x) be the two functions. The formula for composition of functions is given below in different forms. Before going to find the value of f(g(5)), first we have to find the value of f(g(x)). Hence the value of f(g(5)) is 15. Hence the value of f [g(6)] is 19. To find the value of f [2x + 8], we have to apply 2x + 8 instead of x in the function f(x). After having gone through the stuff given above, we hope that the students would have understood "Composition of functions examples".